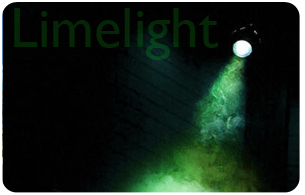 Limelight focuses on interesting Lake Worth artists, collectors and creators. Information about all forms of art from those who love it and create it. Fabio is a fine art painter and muralist with a passion for transforming urban spaces. He first started painting at 14 years old while recovering from a serious accident and never stopped. Since earning his MFA in Visual Arts and Painting from the University of São Paulo, he has participated in the renowned Sarasota Chalk Festival (2014 & 2016) and gallery installations for Art Basel Week in Miami Beach. 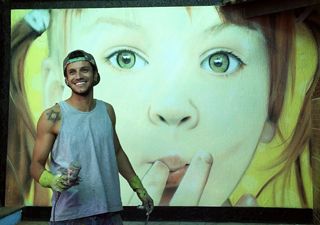 To date, he has designed and installed murals in over 40 schools throughout São Paulo. Fabio's work tends towards simplicity, often using the faces of friends and family to depict vibrant colors and expressive, uninhibited emotions. He draws much of his inspiration from an area's history while allowing his paintings to take on a life and story of their own. His exploratory, impulsive style of painting developed in response to his own near death experiences and quickly became an artistic commitment to letting each moment unfold honestly. Through art, he continues to explore notions of unity and the power of personal expression. For further references please visit Fabio's website, and see his LULA Artist Profile Page. Began drawing in Kindergarten and haven’t stopped since. Through grade school it was all sketching with pens and pencils. Art, electronics and wood shop classes would keep me entertained so I went to trade school. I went to school for Auto Body and began assisting painters with automobile painting and after 5 years I became a painter. Nune' - Fine Artist, Art Educator, Designer who comes from a family history of Artists, discovered her passion in Art at an early age and has a long been a professional artist and has become internationally known for her unusual artwork, conceptual designs, delicate murals , bold statements in a variety of techniques as a painter , sculptor, designer and decorator. Lisa Lewis expressed an interest in drawing early on. She can recall drawing dinosaurs in oil pastel when she was five or six. All though she was involved in athletics gymnastics, tennis, paddleball and swimming in her teens, the love of art was always first as she was chosen to design her Jr. High yearbook cover.